Recognized for more than 40 years for the fabrication of steel buildings, Honco stands out for the quality of its constructions and for the numerous advantages of its products. Honco can custom-manufacture, in accordance to customer requirements, every component of the building structure. Manufacturing facilities of more than 50 000 ft² allow stocking steel of various gauges and colours, to offer short delivery delays. Likewise, every components required for the building structure are fabricated in our plant, without any intermediary, which helps meeting exacting delivery schedules. 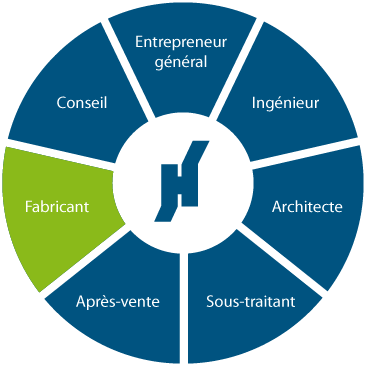 By controlling the fabrication process, Honco is able to offer its customers the best guarantees for drawings compliance on site. At Honco, we offer our customers a vast range of standard or customized colours. A variety of architectural accessories, such as canopies, wall fixtures, and decorative moldings can be proposed for an harmonious architectural treatment.